You can make green by mixing together equal parts of blue and yellow paint, making sure both colors are pure colors and not a variation. 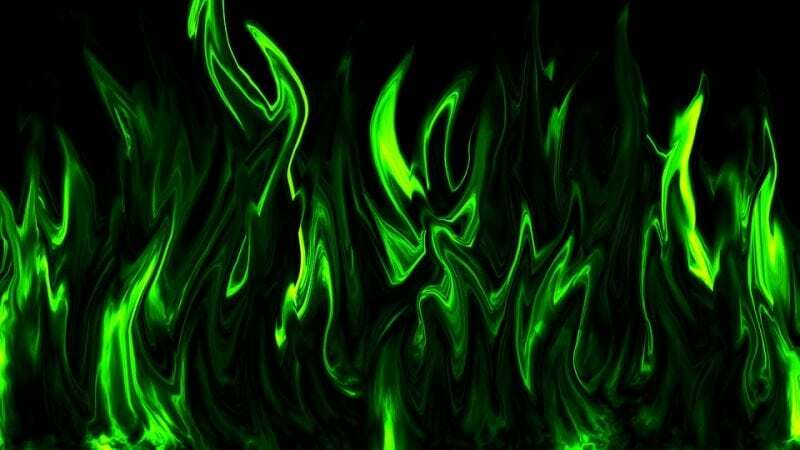 You can make green fire by mixing together borax or boric acid with methanol and lighting it on fire, creating a majestic green colored flame. If you’ve seen fireworks, you know that combustion can occur in a variety of colors. This is also true of fire as well, and fire can be a number of different colors including green, red, and blue. But how do you make green fire? We’ll dive into that below. What alters the color of flames? Is it dependent on temperature or the composition of the substance that is burning? The heat of a flame influences its color. Fires results from combustion, which is the interaction between oxygen and fuel. Typically molecules of oxygen in the atmosphere react with carbon or another fuel source. The exothermic reaction that takes place releases heat, and depending upon how intense the heat released is, the colors of the flames can change. The hottest flames are usually white, while the cooler flames are reddish. As the combustion process goes on, becoming hotter and more complete, the flames will turn to orange, yellow, and then blue. As mentioned, the temperature of the flames influences their color. A substance in the region of 500°C (932°F) will cast off a red glow, while flames between 600 to 1000°C (1112 and 1182°F) will be red. 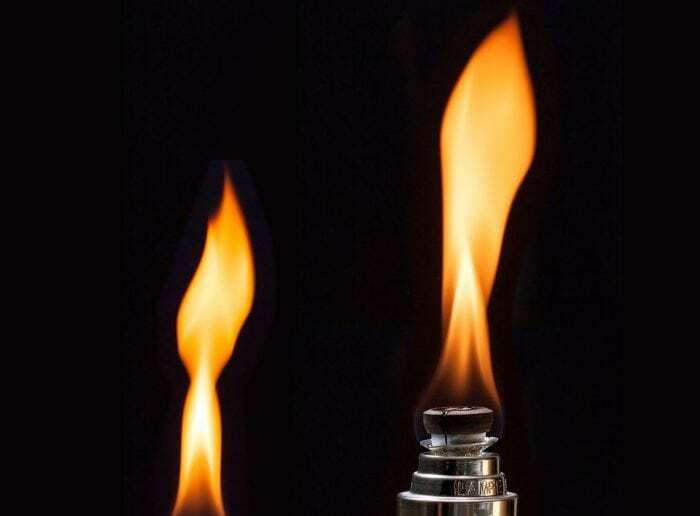 Flames typically take on a more orange hue when they approach between 1000 and 1200°C (1832 and 2192°F) and they will turn yellow when they approach the region of heat between 1200 and 1400°C (2192 and 2552°F). Even higher temperatures will begin to move the flames towards the blue portion of the visible spectrum. Note that the temperatures listed above are just estimates, and other things can influence the color of a flame. The actual points of transformation for a flame will depend upon a variety of different variables like the moisture level in the air, and the chemical makeup of the fuel source. The color of a flame varies because of the chemical makeup of the fuel, in addition to its temperature. As a flame becomes hot enough, the various chemicals present in the fuel source will begin to react to the oxidization process, changing the color of the flames. As an example, when copper ions are heated the energy being released excites the electrons within the copper, which makes them unstable. The electrons then returned to their base state and emit photons, particles of light, as they do so. The photons are released at specific wavelengths of light, which changes the colors. The elements that occur in the world around us can be applied to make beautiful light shows, through fireworks or fires. It just takes knowledge of how the electrons in different chemicals are impacted by temperature to release the protons at the right wavelength. The characteristic yellow color of many fires results from sodium, and many fuel sources like wood contain high amounts of sodium in them. Sodium is an alkali metal that is found in many commercial products like paper, glass, soap, baking soda, and more. Adding sodium salts to a flame will cause it to burn a bright yellow color. Iron can also cause a yellowish flame, though depending on the conditions it can also oxidize orange. Orange flames can be reliably produced by adding a very common chemical to a fire. Calcium will cause flames to burn an orange color, but the color is typically rather muted so it can be difficult to differentiate it from the yellow colors of sodium. Calcium is an alkali metal that occurs naturally in various types of rocks, and calcium compounds are frequently used in food additives, pharmaceuticals, and other products. Flames will turn red with the addition of a bit of strontium to them. Strontium is one of the most abundant elements on earth, being present in many rocks and soils. Strontium salts are frequently used in the creation of flares for roadwork and emergencies because their bright crimson color makes them easy to spot. Green is one of the easiest colors to turn fire, as it can be achieved with a number of fairly common chemicals. The addition of compounds like borax, boric acid, barium, and copper sulfate can all turn flames green. The various compounds will turn the flames different shades of green. The addition of barium to a flame turns it a light green color, often described as lime-green. Depending on the exposure conditions, barium can end up producing a yellow flame without much green tinge. Barium is an alkali metal with industrial applications such as removing problematic gases from vacuum tubes, and as a drilling fluid for gas and oil wells. Copper can also be used to turn flames green, though this also depends somewhat on its oxidation state. Though copper is known for its orange hue when it oxidizes copper can either look green or blue depending on the conditions that it is oxidizing in. When it oxidizes green it is often confused with boron, which produces a very similar color. Copper salts often end up producing a bluish green color. A more reliable green color for flame can be evoked by utilizing boron. Boron is gained from the industrial processing of borax, and boron is often used to create glass and ceramics. When a fire is exposed to boron it turns the flames a bright green. Moving on to the pink/violet part of the visible spectrum, pink flames can be attained by using lithium, potassium, or rubidium. Non-toxic potassium compounds are fairly easy to find, as they are used in a variety of different food sources, such as potassium-based salt substitutes. Lithium is a metal that is commonly used in batteries, while rubidium is a common element that has a variety of industrial applications such as being used in photocells. Rubidium is also used in fireworks to get a purple colored explosion. Potassium often burns a distinctive violet color, though it can also burn a lighter purple, more like lilac. It is often confused with caesium, as caesium burns a noticeable violet or blue-purple color. As a metal, cesium has a silvery-gold quality to it, and it is used in devices like photoelectric cells, thermionic generators, and atomic clocks. As a final note, if you plan on changing the colors of any flames yourself, be sure to be safe and responsible at all times. Use safety gear, stay in well-ventilated areas, and always control the flames. Previous Post« Previous What Is Biomagnification?